A true vintage piece is a unique marriage of history and style. Be it vintage engagement rings, brooches, or bangles, the value of your jewelry is found not only in its present appeal but also in its storied past. For those who understand and love the allure of fine jewelry, verifying authenticity is key to appreciating any piece. Sometimes intricate, establishing credibility is sure to shed new light on even the most loved pieces in your collection. As with every tool used to catalog authentic characteristics, collectors should utilize internet resources intelligently when researching rings. Understanding how to use the information available, in addition to knowing where to find it, will make your search that much easier. This, of course, begs the question: how would I confirm that I indeed have authentic vintage rings, necklaces, or earrings in my possession? To begin, it helps to understand the stones and materials of the pieces at hand. Compared to many modern and contemporary mined gems, antique and vintage pieces feature stones that may differ in many ways from cut and more obvious color variations. For instance, rubies from the 19th century were typically mined in Burma (present-day Myanmar), resulting in the term “Burma Rubies” to refer to these brilliant red and reddish-pink stones. Meanwhile, more modern Thai, Cambodian, and African rubies which can render darker reddish-brown tones. As with rubies, many Victorian, Edwardian, or even older mined stones differ greatly in color to what you may expect from heated and glass-blown jewelry today. Stones hailing from mines in India (the “old mines” for which the cut is named) were prominent in engagement rings until the 1900s, when South African mines began to dominate the industry. Though designed to have larger reflective facets, these diamonds do not have the chemically treated, prismatic luster associated with modern, heated diamonds. The brilliance is oriented from the cut itself. Additionally, the precision of the cut is directly tied to the hands of the jeweler, with each diamond having a unique set of characteristics singular to hand-cut stones. 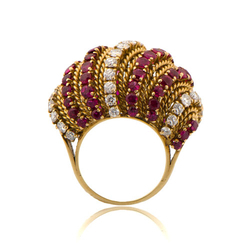 Van Cleef and Arpels, the Paris-based, international jewelry house, often incorporated naturalistic and floral motifs evocative of the grandeur of the Art Nouveau period (hinted at in this striking VCA vintage cocktail ring), Van Cleef and Arpels evolved with the times to craft pieces that borrow and update aspects of Art Deco, Edwardian and even late Victorian styles. Vintage engagement rings from the house typically bear a characteristic signature and enumeration on the shank, sometimes with the country of origin (usually France). What Marks to Look for? A true Van Cleef and Arpels piece of jewelry will be notated by the trademark, serial number, and metal hallmark. While the trademark, which is sometimes known as the “brand stamp,” has changed over time, it must read “VCA” or “Van Cleef & Arpels;” a piece simply stamped with “Van Cleef” is a sign of forgery. Additionally, VCA has famously used only 18 karat gold, so each piece will also read “750” (a typical identifying stamp for this precious metal). Like VCA, Tiffany & Co. has etched its standard for quality and beauty into the collective consciousness. From its founding, the luxury house dedicated itself to a standard of authenticity with trademark engravings and eschewed the haggling that was commonplace at the time (in fact, the earliest Tiffany creations were not available by credit). The dedication of Tiffany & Co to their customer base often showcased itself in unorthodox and exciting ways: providing superior silver implements for Union Soldiers during the Civil War, lending their unparalleled sense of design to the police Medal of Honor, and updating the design of the Great Seal of the United States. 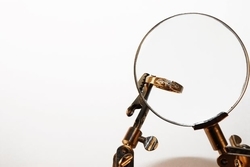 It should come as no surprise that this rich history lends a tremendous worth to any and all of Tiffany’s authentic vintage rings and necklaces, such as the exquisite antique Tiffany lorgnette pictured. Thusly, authenticating them as true and verifiable Tiffany & Co. pieces is imperative. As with the VCA creations, Tiffany’s works of art exemplify the work of expert jewelers. In addition to the definitive markings of authenticity, every detail of a Tiffany & Co. piece is characteristically precise. Houses that define the world of fine jewelry have never done so by cutting corners, and another key to verifying the authenticity of vintage engagement rings, necklaces, and other pieces is to look closely at the quality of the piece. Experts concede that talented counterfeits can often be deceiving, but upon closer inspection will always fail to measure up. For instance, the famous Tiffany Heart Toggle Necklace has both the trademark engraving on its pendant (“Please Return to Tiffany & Co. 925”), and nearly invisible solder marks on details such as connecting links, which, like the links in the necklace body, are comprised of the beautiful sterling silver Tiffany is known for. Inspecting a facsimile will reveal the engravings’ font is slightly off, the weight is lighter, and connecting links are poorly assembled of cheaper materials: details which, in their richness, highlight the singular standard that separates a truly unique jewelry house from an average one. When attempting to establish the variability of authentic vintage rings, look first for the engravings (“Tiffany & Co.” or “T & Co.”), and remember that Tiffany & Co. has a hallmark font that graces their creations, and within those trademarks are notations of the metal purity: 18 karat gold with ‘750,’ platinum with ‘950,’ and the trademark of Tiffany & Co., sterling silver, with ‘925.’ Settings on the piece should be positively flawless, with no jarring or noticeably oblique spaces between links. Additionally, the stone’s setting should never move or show noticeable connection points, which brings us to our next method for determining authenticity. Most people don’t realize that the precious stones will be one of the greatest indicators to the authenticity of the jewelry. GIA certification is a great help to collectors. While many are familiar with the standards of the colloquially known “4 C’s,” the criteria of color, cut, clarity, and carat weight feature prominently in the selection and verification of vintage engagement rings. Only high clarity is accepted by houses like Tiffany & Co. or Van Cleef and Arpels. Any stone that lacks GIA certification and features a noticeable lack of luster and brilliance is a red flag. Authentic vintage rings originating from Cartier feature distinctive GIA characteristics that distinguish them immediately. The cut, for instance, will fall squarely within the range of “excellent” to “good” on the GIA scale, displaying an astounding symmetry and showcasing an alluring brilliance in its facets. 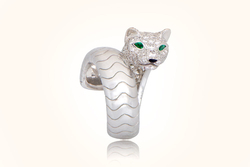 Additionally, Cartier diamonds are strictly selected from a range of VS2 to IF. Many stones are IF, which stands for “Internally Flawless.” That flawlessness is a standard of excellence maintained from the stone to the setting of each and every Cartier creation. Understanding the evaluation of precious stones, as well as the history of the gemological methods used to cut and set them, is pivotal to analyzing the quality of any estate jewelry collection. While this acuity is important in the selection of any and all fine vintage pieces, it is absolutely essential in the authentication process of vintage engagement rings. Beyond the high standards of gemstones chosen by premier jewelers, the history of many prominent gems is made more apparent by the techniques used in their creation. The methodology – and by consequence, the study – of gemology that has been passed on from master craftsmen to their apprentices has evolved over the centuries. This evolution shows in iconic eras of jewelry design. As technology in cutting advanced, so too has the industry standard of cuts, thus affecting each era’s style. Quality aside, the hallmarks of artistry of modern pieces and authentic vintage rings differ greatly, and in that difference emerges the unique nature of a true estate piece. “Diamond cutting” emerged in the 16th century as the natural evolution to “polishing,” a process dating back to antiquity. Technically, this gave rise to the widespread use of the “table, facet, and point” to note the anatomy of a diamond cut into creative shapes that allowed the full extent of the stone’s natural beauty to shine through. The Baroque period saw the earliest incarnation of the “brilliant” cut, with the first “round” and “square” cuts appearing in the candle-lit dining rooms of the 17th century. Due to the cutting process of the time (which involved cleaving, as opposed to mechanical cutting), these bare asymmetrical facets of vintage engagement rings are more strikingly organic when compared to modern square, round, or cushion cut diamonds. 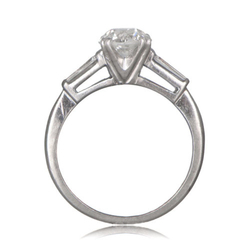 As true craftsman are wont to experiment, improvisations in the cutting process gave way to what would eventually be called the “old mine cut,” showcased in this 1.62CT Art Deco Style Engagement Ring. Predating the contemporary, machine-assisted “brilliant” cut we know today, the old mine cut featured a high crown and small table, a rectangular girdle with softer edges and a large culet at the diamond’s base. The girdle, or center section between the crown and pavilion, was much thicker in the old mine cut, and the pavilion ran very deep. The resultant stone was striking, with larger, triangular flourishes that shone brilliantly even in dim light. To learn more about old mine cuts, click here. Spanning Queen Victoria’s long, historic reign, the Victorian Era marked a turn to ornately feminine and opulent jewelry design. Jewelry from this era is typified by a fondness for all things gilded, with romantic floral patterns. Authentic vintage rings from this period, such as this rare 2.50CT antique Victorian engagement ring, reflect the lavishly elegant cluster configurations that became popular during this time. Look For: Vintage rings, especially engagement rings, were typically centered around birthstones and brilliantly colored gems rather than diamonds. However, diamond solitaire rings became quite fashionable during the Victorian period. 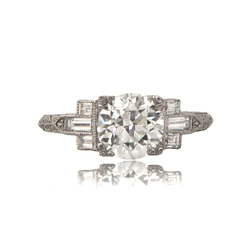 Edwardian vintage engagement rings, much like their modern counterparts, organized their design around the diamond. Sophisticated and regal, these rings are rarer still for their innovations in design. 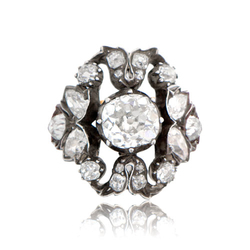 This Antique tapered baguette ring encapsulates the Edwardian, diamond-centric sensibility. 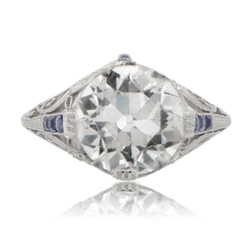 Look For: In authentic vintage rings from the Edwardian Era, you may spot “milgraining,” or subtle borders of platinum beads set around central stones to highlight their luster and quality. The famous Art Deco movement came on the heels of Art Nouveau and is often viewed as a striking reaction to the fluid and organic elements of this earlier period. Art Deco Jewelry, as brilliantly exemplified by this antique Art Deco diamond and sapphire engagement Ring, is characterized by glamorous detailing and bold geometric angles, evoking the bold spirit of futurism that defined the era. 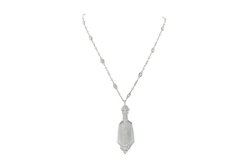 Look For: Pay close attention to Calibre cuts to highlight the streamlined, modern appeal of true Art Deco jewelry. Additionally, many pieces boldly feature black onyx or coral as expressive accents. Of course, with any and all of these resources, it is important to work with a trusted name in the estate jewelry industry. Professional jewelers and gemologists are trained in a centuries-old craft that’s rooted in nuance, subtlety, and an impeccable attention to detail. As we’ve stated, online research and shopping have lifted a certain veil of mystique surrounding antique and vintage jewelry. However, if you’re seeking first-hand knowledge on pieces with a brilliant style and rooted in history, then consulting a true professional will give you a context for the pieces in your collection. Also, should you choose to have your vintage engagement rings or other pieces appraised, you may be surprised at their present-day value in addition to their intangible heirloom quality and worth. With over three decades of experience in rare and antique gemology, Estate Diamond Jewelry is an indispensable source not only for the finest luxury jewelry of the past two centuries but also the highest standards of authentication for jewelry of historic significance. When seeking to verify the authentic vintage rings in your collection, you can expect the team at EDJ to provide knowledgeable and dedicated assistance. For more information regarding our collection and services, we invite you to contact us or arrange a visit to our Manhattan showroom. We look forward to assisting you.